To be pitted: whistled through with wind enough to anchor every anther-fleck. The daily drama: keeping time. Do tell of the sharp note doubt makes in the lay, how gold-bronze turns tamarack or snuff, how heat’s details draw out your sweet debut. Be guileful, dauntless, slight, adroit. Regret orr, my jewel, translucent and unknown. Curated, handled, hand-picked: from the first, your bearing’s blown. 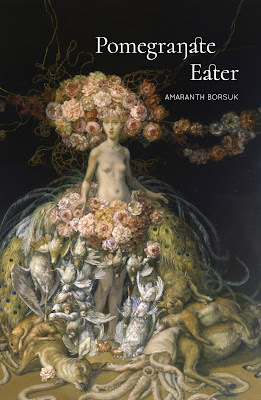 American poet Amaranth Borsuk’s second full-length collection is Pomegranate Eater (Tucson AZ: Kore Press, 2016), a volume of striking lyric poems that play off classical myth, lineages and classical artworks, from her opening poem “Self Portrait as Radiant Host” to pieces such as “Cubist Landscape with Immolation,” “Portrait of Death as Pine-Eater” and “Landscape with Openings.” Further on, by the third section, the focus leans toward elements of myth, from poems such as “Legend in Which a Diligent Clock Is Made to Speak,” “Fable Wherein Contra Band Encounters Boon,” “Parable in Which One Wrestles a Double,” “Allegory in Which a Gregarious Knife Is Buried” and “Apalogue with Substitutions in Which a Shift is Made.” What becomes intriguing about Borsuk’s poems is in how far she is willing and able to float across dreamy spaces, utilizing a series of voices, even as she holds one foot in the concrete, anchoring each poem before it falls into an impossible abstract. Pomegranate Eater contains poems held together with a precise and lyric language, somewhere between diamond precision and a kind of liquid permanence. Part of what appeals about this collection is in the musicality of her lines, the way the lyric flows and ebbs, shifting amid and between meaning and pure sound, as she writes in the poem “FORTIFIED INTERNAL NIGHT”: “Don’t porrect, I sum but a massive / simper, a lost-cause turnip voluptuary. / Suspend voluntary seeming solicitude. / All I want you magnify—sad suspect, / I’m present, a fringilly condensed / fugue-yahct. Noon cellar risky gravity / orchid tantrum. I negate risk; I’m / mum.” Her poems pop and sizzle, and sparkle across a range of fireworks and sun reflecting off of running water. this trying to fingerprint each thing we touch. of hooks we anchor to. This thing we’re building is a room, no more. A small space to stem the hurt.